Elephone is the Chinese smartphone company which has some really cool smartphones under its sleeves though not being that popular in the Android market. 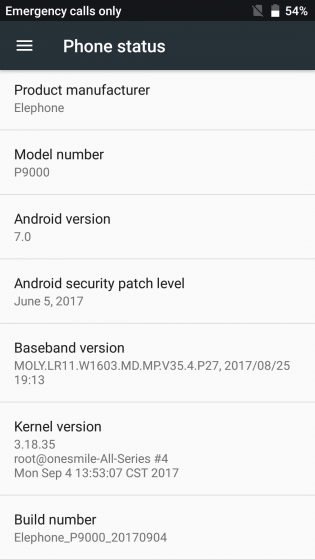 One such device P9000 is receiving Android 7.0 Nougat update. It comes with build number 9000-20170904. Along with the OS platform upgrade, optimization of system stability and fix for dialling function also follows the Android 7 Nougat for Elephone P9000. Strangely enough, the security patch goes all the way down to June 5, 2017. This one could be a huge drawback in today’s date where so much security threats are rising against smartphones. The upgrade is seeding over-the-air(OTA) as usual. However, one has to be on stock firmware to be able to install the OTA. Apart from that, we have also included the latest stock ROM which users can manually download and install. The complete details on flashing instructions can be seen below. Before you get ahead with the firmware installation you need to have some tools. Download links for the same are given below. Here is the link to get the stock firmware that will take the P9000 to the Android N.
For a more detailed and illustrative tutorial follow the link below. How to update Elephone P9000 manually to Nougat ROM using SP FlashTool? Step-1 Download the device driver and save the file to your PC. Step-2 Unzip the file > Double click to open the file. Step-3 Now Right click on DriverInstall > choose Run as Administrator. The device will install automatically. Step-4 Now Download the stock firmware/ROM from the above link. Step-5 Open the SP Flash tool > Click scatter-loading button. Step-7 You will see the file MT6582_Android_scatter.txt. Open it. Step-8 Make sure all the files are checked and selected. Step-9 Click on Download and then connect your phone to USB cable. Wait for some time while the download finishes. That’s all about it. So, now enjoy Android 7.0 Nougat on Elephone P9000. Keep scrolling on AndroidSage and follow our social media pages for all latest updates on everything Android.